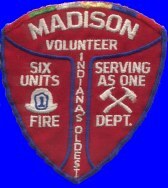 Madison is home to six independently contracted fire companies, which consist of 5 engine companies, and 1 quint company. 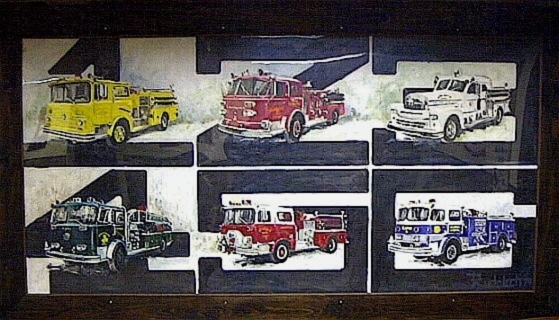 This painting hangs on a wall in the meeting room of Clifty Six Fire/Rescue. This picture, painted in 1979, depicts Madison V.F.D. 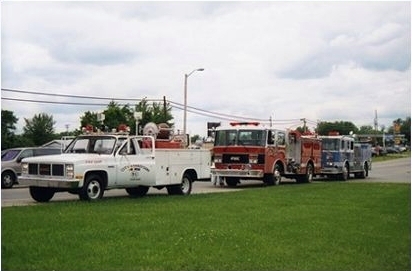 apparatus as they appeared prior to the new purchases that began in 1989. The colors of the apparatus were carried over to the new purchases. Current Apparatus : E-One Cyclone (1994) with a 1250 gpm pump and a 500 gallon tank. The logo on the rear cab door is that of "Little Jimmy", the weathervane that is mounted on top of the "Ones" station. Jimmy is dressed as a turn of the century firefighter. Firehouse built in 1848 (Oldest firehouse still in use in Indiana). 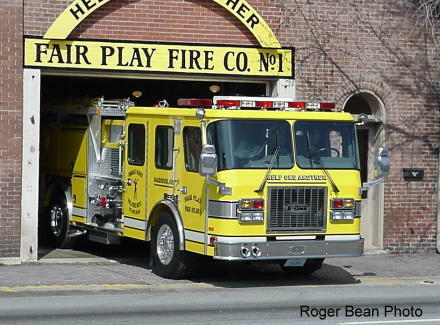 Current Apparatus: Seagrave Engine (1994) with a 1250 gpm pump and a 500 gallon tank. This apparatus has a nickle plated 2 and bell that were originally used on a steam engine. These items are now on the Twos fourth motorized unit. First Fire Company in Madison to purchase a non-red apparatus in 1939 by purchasing a white Seagrave engine. Current Apparatus: Spartan/Darley Engine (1989) with a 1500 gpm pump and a 500 gallon tank. 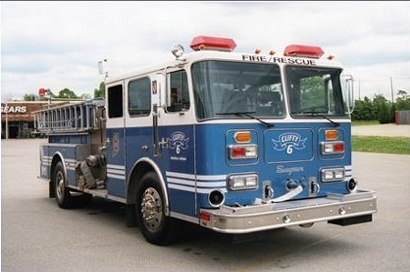 Current Apparatus: Seagrave Quint (1994) with a 1250 gpm pump and a 250 gallon tank, with a 100ft. aerial ladder. First Company established on Madison's hilltop. Current Apparatus: Pemfab/FMC (1989) with a 1250 gpm pump, and a 750 gallon tank. GMC truck with a Reading utility body (1986). Current Apparatus: Seagrave Engine (1993) with a 1250 gpm pump and a 500 gallon tank. 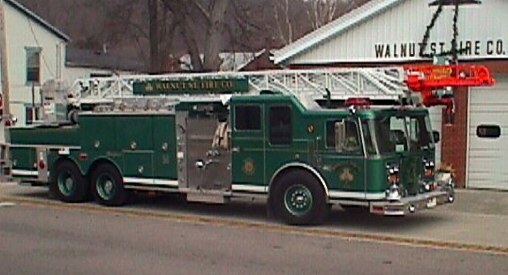 Pierce/Chevy (1979) mini-pumper (used as a rescue truck) with a 400 gpm pump and a 250 gallon tank. Cotner/Chevy ambulance (1974) used as a rope rescue truck. 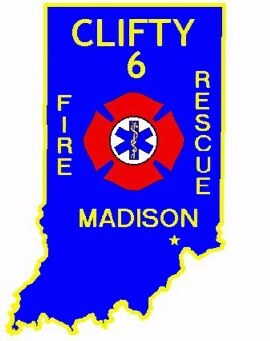 Clifty Six not only does fire suppression but also extrication and rope rescue for the city of Madison and the eastern half of our county. Clifty Six is also the sponsor of the Clifty Six Fire Explorer Post 706.